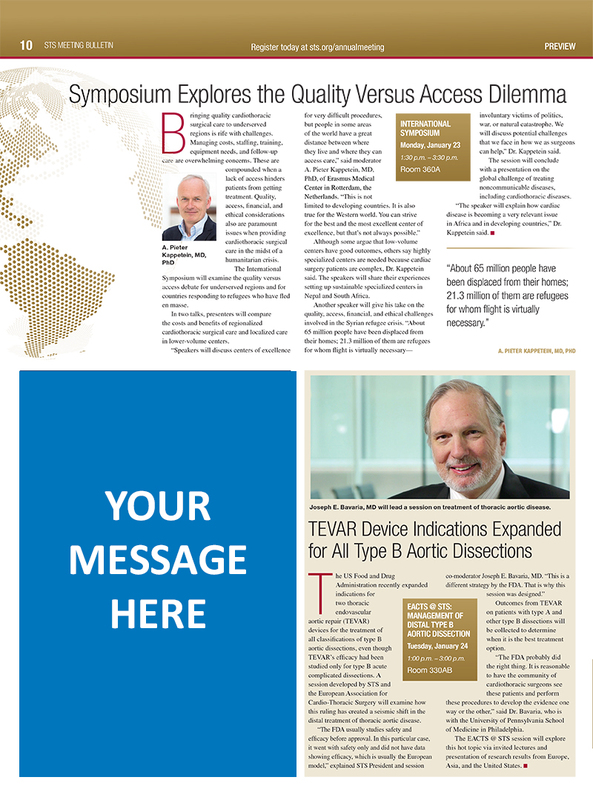 Where cardiothoracic surgery professionals go for the latest trends, products & services. Be the early bird! 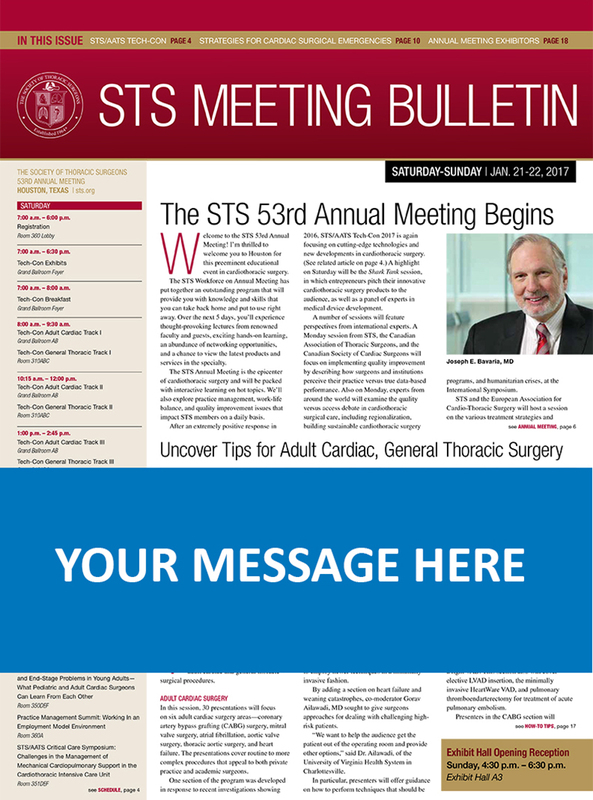 Connect with STS members and Annual Meeting attendees before they even set foot on the meeting floor. 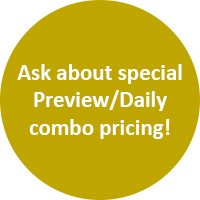 The Preview jumpstarts your messaging and prepares Annual Meeting attendees to engage with you onsite. 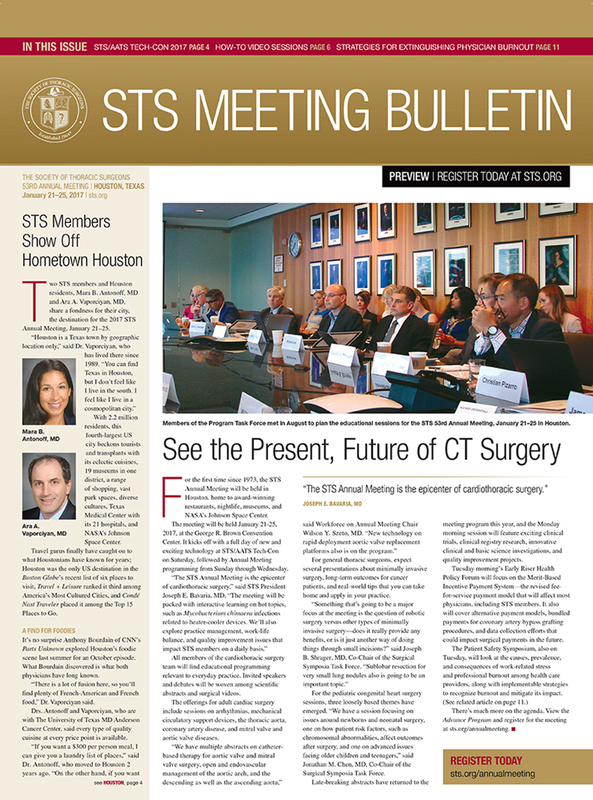 Mailed to 6,000 cardiothoracic surgery professionals with the peer-reviewed journal, The Annals of Thoracic Surgery. 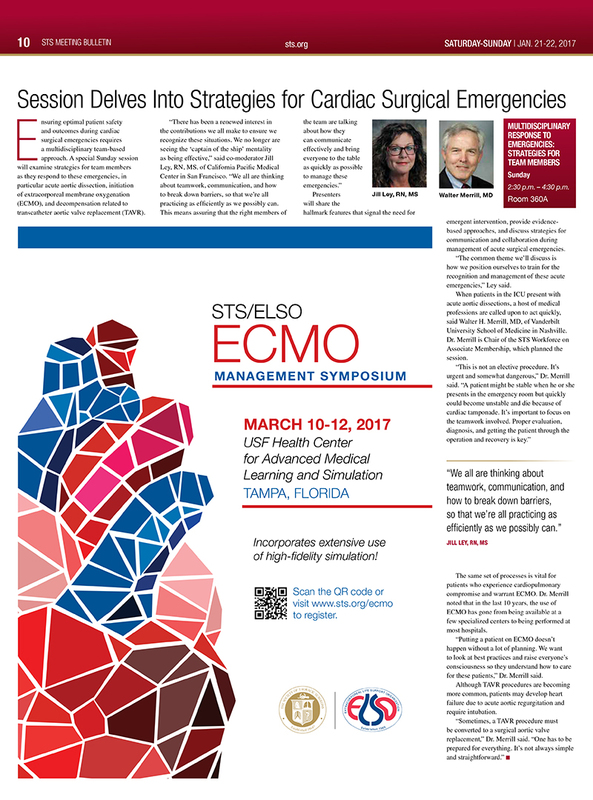 Issue includes meeting review, programming overviews, schedule of events, hot topics, speaker coverage and exhibit hall highlights. Make a daily connection! 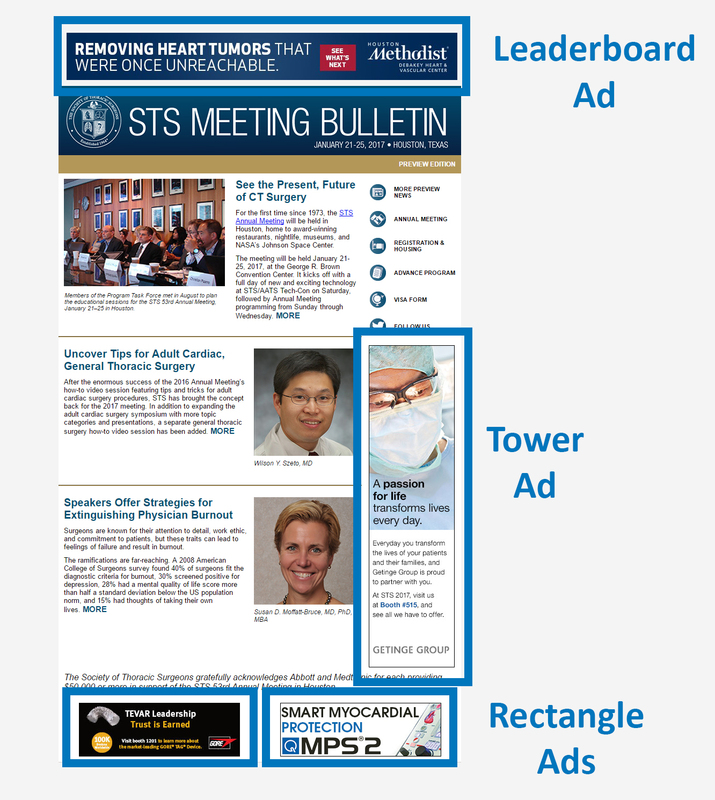 Get your message into the hands of cardiothoracic surgery professionals every day onsite! 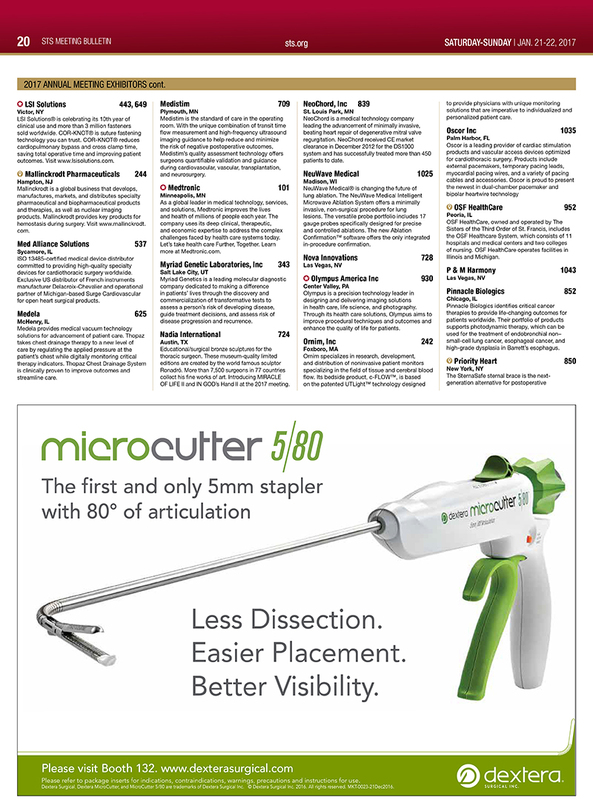 Delivered every day to 2,750 attendees via newsstands and handout personnel throughout the convention center. 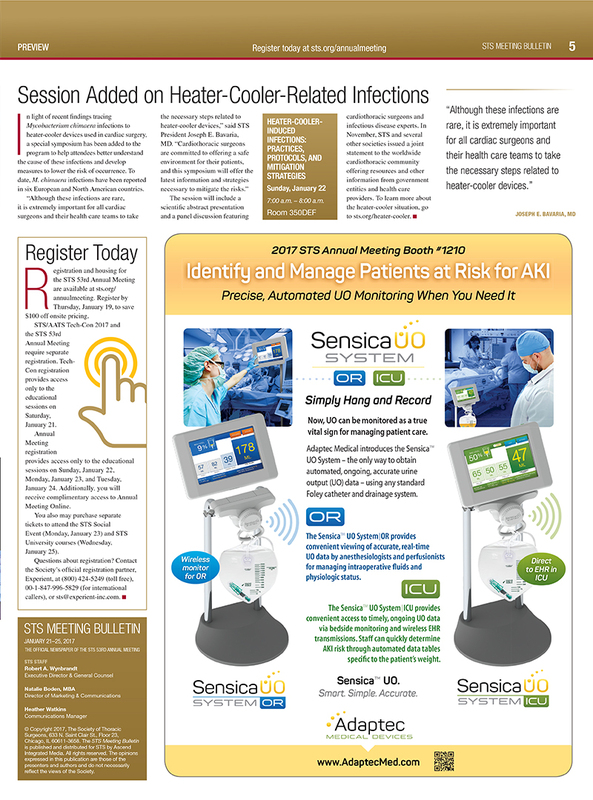 Includes live coverage of the Annual Meeting, including session reporting, exhibit hall highlights, agendas, networking opportunities, photos and more. 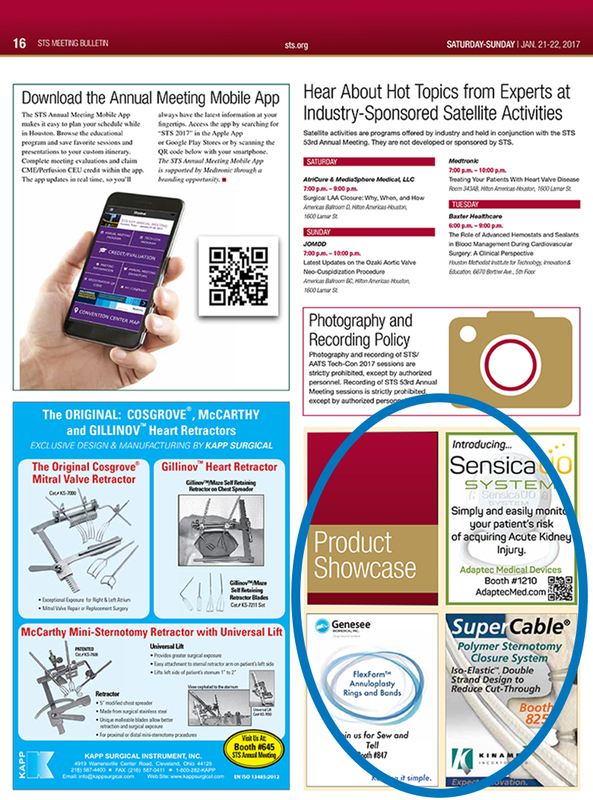 Floor Map Premium includes banner ad on the floor map page, your booth highlighted on map, and a full page ad. 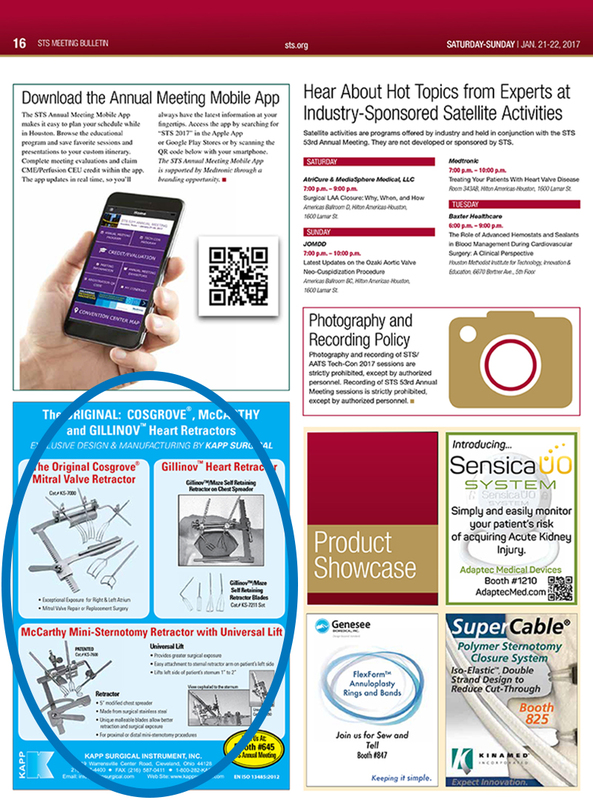 Product & Services Showcase ads include layout and design of your ad. 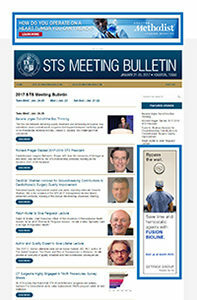 Official meeting eBlasts sent to more than 7,300 STS members and current registrants drive traffic to the site. 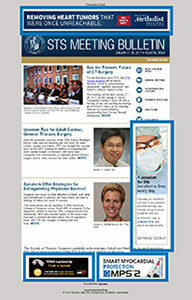 This landing page is the hub for the most up-to-date conference news. Appears on landing page and key content pages. Limited to three advertisers. Appears on content pages. Limited to three advertisers. Build your brand connection before the meeting begins! 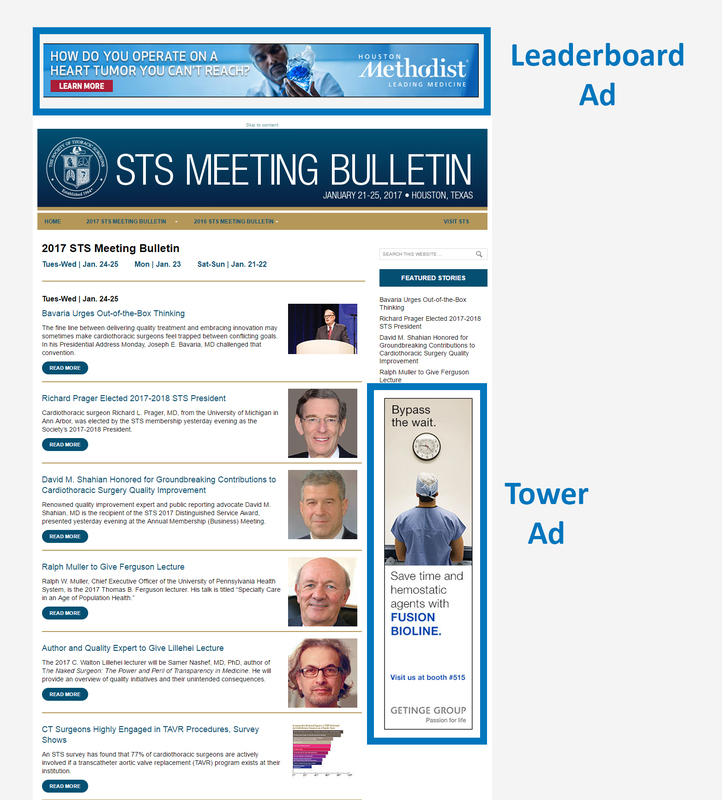 Launched before the meeting to more than 8,000 STS members, current registrants and previous attendees. 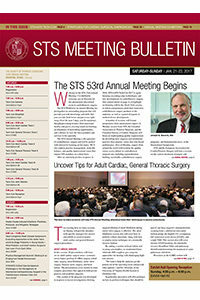 Articles showcase the meeting and assist attendees in planning their time onsite. Includes placement in all three issues. Limited to one advertiser each. 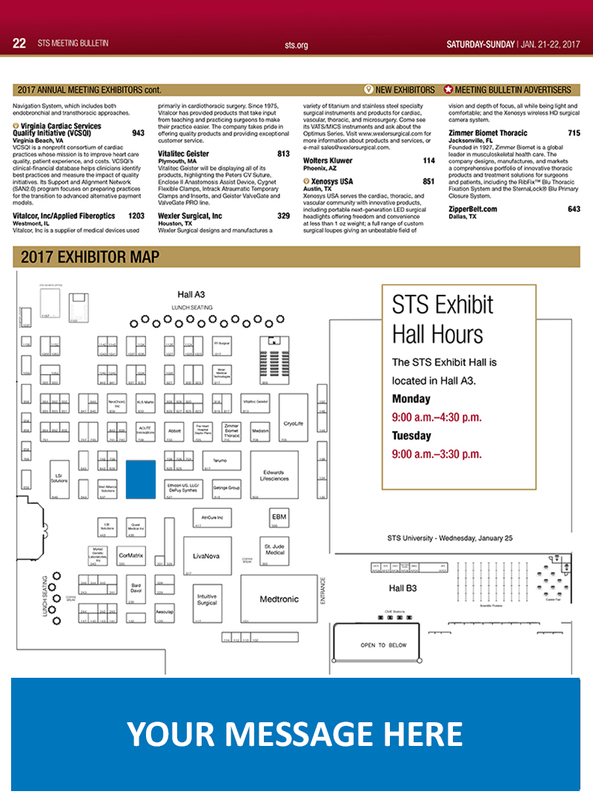 Drive traffic to your booth and market your solution to those not in attendance. 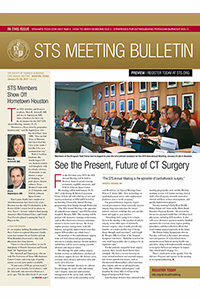 Launched each morning of the meeting to more than 7,300 members and current registrants. 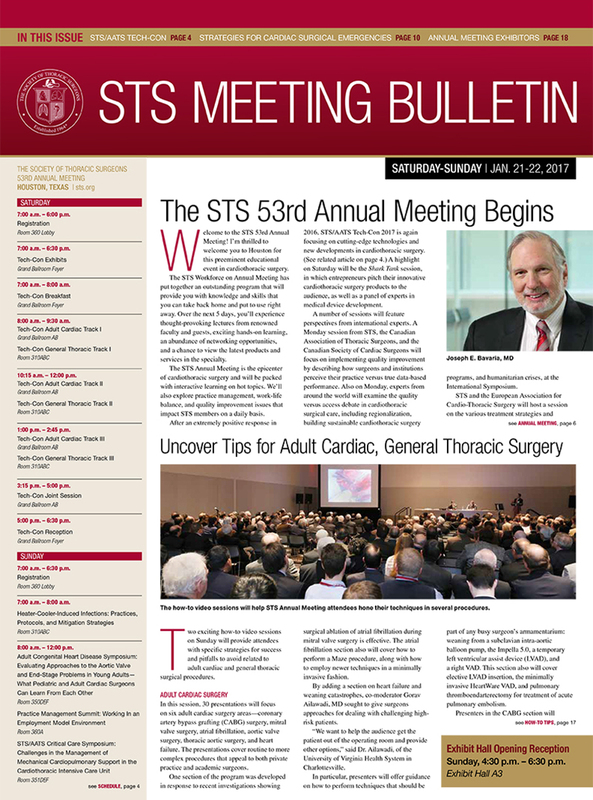 Live coverage of the Annual Meeting to include session and meeting highlights.